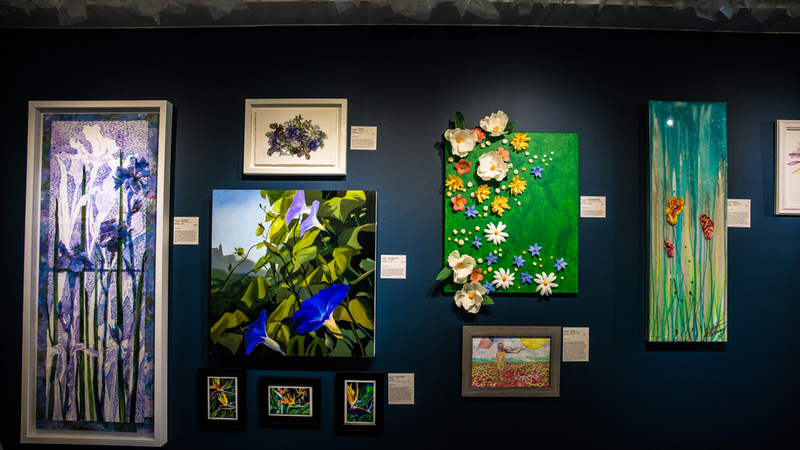 Flower Power is an exhibition that embraces the diversity of florals through different interpretations from scientific, photorealism, 3D, mixed media, abstract, and watercolor. 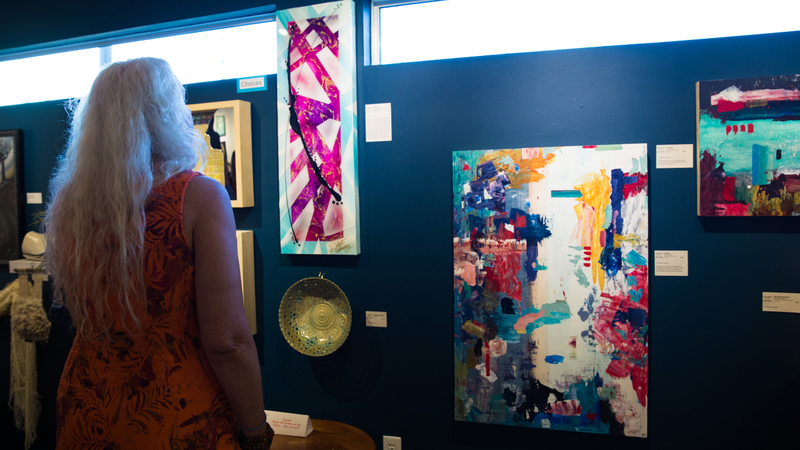 Featuring 15 Artists: Carefully Crafted by Abigail, Chloé Jane, Cindy Lee Cassell, Clair Gaston, Dave McClinton, Dréa Peters, Emily Michele Berry, Heidi Miller Lowell, Jacob LaPan, Katie Dunkle, Marjorie Moore, Nevena Bentz, Rebecca Klier, Robert Calloway & Todd Shepherd. Seeing spring wild flowers on my drive always makes my day better and brings a smile to my face. So I wanted to create a piece that embodies the same happiness and joy with paper and paint. 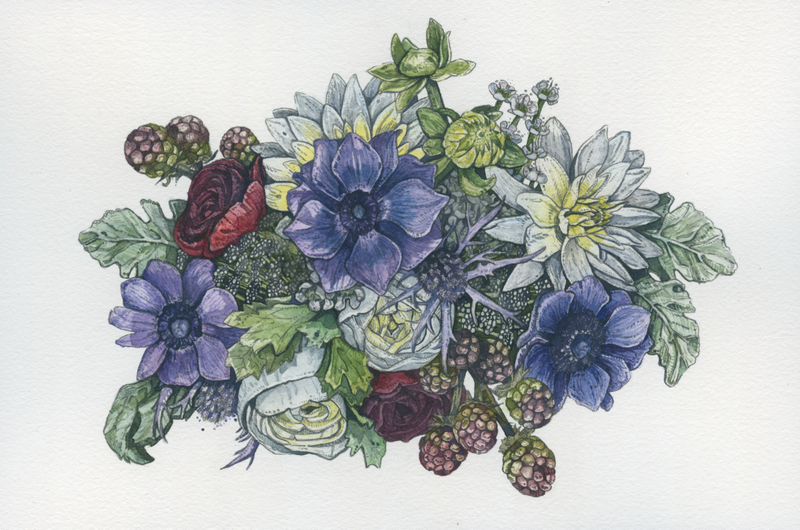 This piece was created for a friend who is a local florist, the name of her business is Davy Gray. in the arrangement and I really enjoyed that! Cindy Lee is inspired by subjects that radiate a unique spiritual energy. Her renderings, landscapes, and floral compositions echo themes of the nature’s beauty, light, transformation and abundance. Her portraits capture the soul and spirit of the models, not just their physical attributes. The artist states, “It is my greatest desire to capture a unique spirit in all that I paint. I particularly enjoy creating pieces that bring meaning to the lives of others - capturing a special moment or recreating a cherished memory.”! 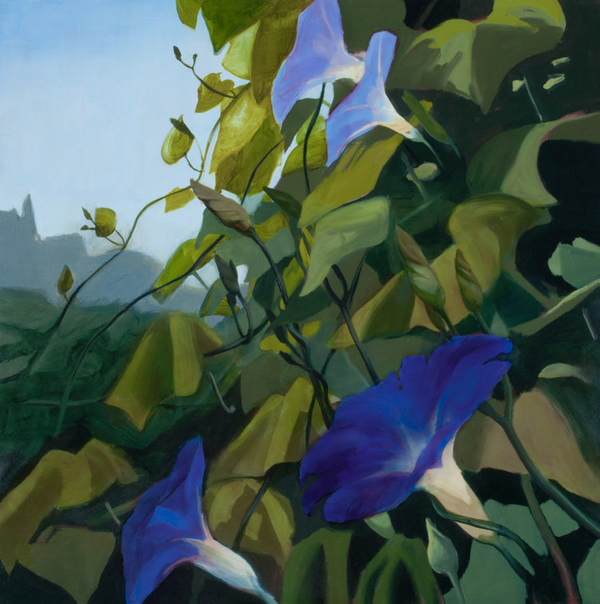 I was interested in the rich luminous colors of the Morning Glories,their intertwining vines, and deep shadows. The title comes from thinking about relationships and connections, how we all need support to flourish, and the sinking times when life seems overwhelming. A digital collage of various textures and objects photographed during daily walks. The act of looking, and staying open to the notion that everything, every view can be rendered as art. that intermittently distracted the eye from all of the concrete. an injection of organic color and texture. this piece represents that glorious cascading color bursting through the never ending span of concrete that was all around us. The magic of poetry enables the reader to have the possibility to step into other worlds with each word. The poem by e.e. cummings "I will wade out" is one of those pieces of art that paints such a vivid picture within my mind that was just yearning to be brought to life onto paper. "I will wade out until my thighs are steeped with burning flowers" brought forth such an intense visual of the Divine Feminine basking in the beauty of her surroundings. The possibility of exploring and connecting deeper to her own true nature and spirituality is hers, ripe for the taking. Inspired by a video of the Eroica cactus featured on National Geographic. A beautiful flower on top of a tough cactus is a tender and inspiring sight. 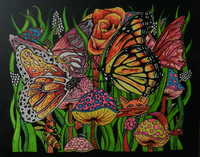 "In the Eyes of a Butterfly"
Inspired by the point of view of butterflies in their vast world of plants & flowers. Inspiration based off of a snake's ability to "slither" through their surroundings with ease. For painter and illustrator Katie Dunkle, home is a mobile, solar-powered tiny house. As her studio travels from coast to coast and the plains in between, she creates crisp, vibrant renderings of the flowers she finds along the way. 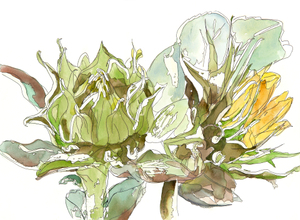 She is inspired by the delicate and detailed nature of individual flowers. Iris Prismatica” is the welcome slender blue flag iris of spring. Often depicted in Japanese woodcuts, the iris motif influenced the 19th century art nouveau designs of the architect and artist Charles Rennie Mackintosh. Using these references as a starting point I depicted the iris in watercolor and the combined media of ink stained mylar to create a new dimension of this often interpreted flower of spring. Inspired by the ability of lilies to pierce the underwater gloom and emerge to blossom as one of the most magnificent flowers. We humans can do the same if we reach for the light. Marks, patterns, and layers of color that create images that push the boundary between abstraction and imagery. Darks and brights work in layers to suggest a bouquet of color coming into focus. Marks, patterns, and layers of color that create images that push the boundary between abstraction and imagery. Imagine a field of wildflowers and try to take in all of the color and shapes as a spring breeze rocks and sways them in and out of focus. 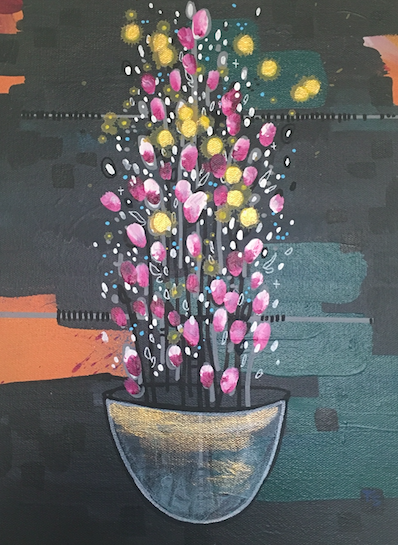 In Bloom, incorporates colors that are vibrant and engages the viewer to feel inspired and an emotion. By using bold colors, textures and through the use of positive and negative space; this painting comes alive. 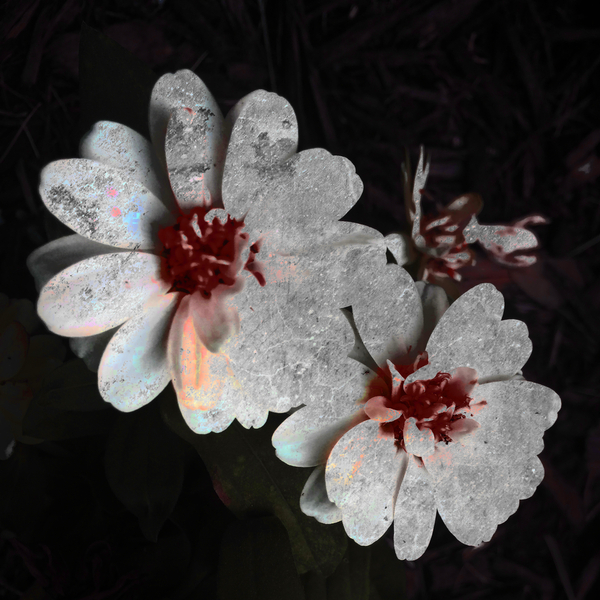 Creating the flowers out of modeling paste allows the viewer to touch as well as look. to ensure the best quality is preserved for many years. Inspired by life and nature in general. Abundance ! !